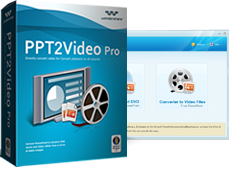 Wondershare PPT2Video Pro is an all-in-one PowerPoint to video converter that converts PowerPoint presentation to WMV ( Windows Media Video) and more video formats. All animations, narrations, audio files and movie clips will be well retained in the publishing WMV output. With this PowerPoint to WMV converter, you can play PowerPoint presentation in the form of WMV anywhere with ease. 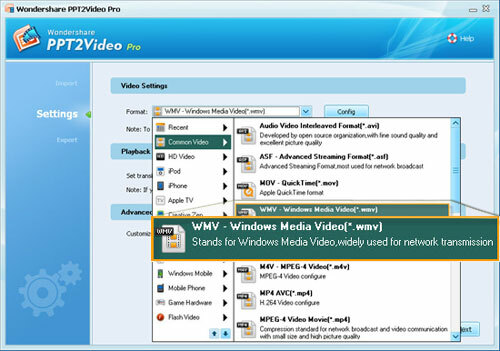 Lauch PPT2Video Pro, and click Create Video Files From PowerPoint. The operating menu appears. There are mainly 3 steps to get the PowerPoint presentation to WMV conversion done: import the PowerPoint presentations, select WMV as the output video format, export the WMV output. Click Add to import presentations from your local disk. You can import up to 12 PowerPoint files at one time. All sorts of PowerPoint files are support, including ppt, pptx (PowerPoint 2007 and PowerPoint 2010 files), pps, and pptm files. 2. Select the ouput video format. On the Settings Tab, you can select the ouput video format and set parameters such as Resolution, Frame rate and Encorder for the publish video. Select WMV as the output format, and click Next to go to Export Tab. Further more, you can set transition time between slides and there are advanced settings for your to customize the video margin, logo and backgroud music. On Export Tab, choose the Output folder for the output video. And click Start to begin the PowerPoint to WMV conversion. A few minutes later, the PowerPoint presentations have been converted to WMV files. Now it is easy for you to share your WMV presentations on Web or most portable devices.